Once you are comfortable throwing cylinders, you may want to take on the challenge of throwing lidded jars. There are several types of thrown lids. Here we will discuss how to throw a basic inset-style lid. In throwing lids, there are two main challenges. The first is to form the gallery flange. The second is to fit the lid and jar as closely as possible. This requires that you measure the jar and lid accurately, which is best accomplished with pottery calipers. Begin by throwing a cylinder. As you complete each throw, leave a goodly section at the top that is thicker than usual. The actual amount you'll need to leave thickened will depend on the size of your pot, but it should be about one to three inches. After the last throw to pull up the walls, finalize the lower portion of the jar into the form you desire. Clean up all liquid in the jar's floor and remove any excess clay from around the foot of the pot. Do not cut the pot free of the bat yet. Working with clay you left at the top, support the wall on the outside with your right hand. The first two fingers on your left hand will be forming the flange of the gallery. The upper finger should be placed at the rim and will press down and toward the right. At the same time, the lower finger ​should be at the base of the bulge of clay and will pull upward on the excess clay. Since the two fingers are spread, with one and the top and one at the bottom of the excess clay, the excess will move into the gap forming the flange. Keep the flange at about the same thickness as the main wall of the jar. You do not want the gallery flange to be too thin. Once the gallery flange has been formed, it is important to compress it. I find it works best to use a chamois, just like when I'm compressing the rim of a pot. Be sure to support the outer wall of the pot with your other hand. Do not cut the pot free from the wheel yet. In order to know how large you will need to make the lid, you must first measure the jar's mouth. Although this can be done with a ruler, it is much, much easier and more accurate to use potter's calipers. As you get ready to measure the inner width of the jar's mouth, make sure that the pot's outer wall above the flange is either straight up and down or flares outward slightly. Measure so that an imaginary line drawn between the two points of the calipers go directly through the center of the pot at the base of the gallery. Mark the measurement, then cut the jar off the bat. Set the pot aside on its bat to dry. The lid is thrown upside down. What will become the top of the lid is trimmed once the lid is leather-hard. 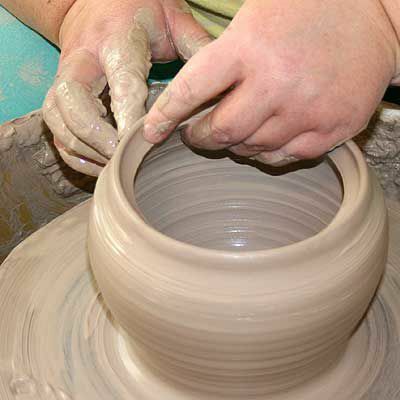 If you wish to form a handle while trimming away the excess clay, you will need to throw the lid as if it has an extravagantly thickened floor. Another option is to attach a handle onto the lid after it has been trimmed. On a second bat center enough clay to form the lid, plus up to about one pound of extra clay as desired for a handle. Or, if you prefer, you can center much more clay and throw the lid off the mound. Keep in mind as you work that the lid's wall should be the same thickness as the jar's wall. The example will be a domed inset lid. Therefore, it is thrown as a bowl form. Just as with other bowls, be sure to compress the floor to avoid S-cracks. You can see that there is a great deal of clay left below the lid's rim that will be trimmed away later. Set your calipers to the inner measurement of the jar's mouth. Use this to measure the outer dimension of the lid, again taking care to measure across the center of the lid. Move the rim inward or outward as needed. Once you have the lid close to the right measurement, clean up any liquid or slip. Check to make sure that the upper quarter inch or so of the lid is at the vertical. Make the groove for cutting the lid free, but do not cut it free yet. Once everything else is done, use a wooden trimming tool or other straight-edged tool to square out the rim of the lid as shown in the photograph. Important: Just prior to cutting the lid off the bat or mound double-check the measurements. You will almost certainly have to adjust the lid again to some degree. As soon as the clay has stiffened enough not to deform, the lid should be placed on the jar. Since the clay is still fairly damp, there is a possibility that the clay may stick the lid and jar together. To avoid this, tear strips of paper towel and lay them across the rim and gallery on the jar. I prefer to cover about 75 to 80% of the gallery's area. Set the lid and jar aside and allow to dry to leather-hard. Thrown lids are trimmed while seated on their corresponding jar. In essence, the jar itself becomes a trimming chuck. Trimming the lid is the same process as trimming out a foot ring. The only substantial difference is in what areas are removed. You may, however, find it somewhat easier if you keep a fingertip on the top of the lid. This will help it not to shift in the jar's mouth. If you are trimming out a handle, make certain that you do not encroach into the handle's area with the trimming tool too soon. Remove the outer excess clay first. Remember that the lid's thickness should match that of the jar's wall. When trimming out handles, a variety of loop and ribbon tools with slightly different profiles may be useful. These allow you to undercut the handle more easily and shape it to the desired configuration. Once the lid (and possibly the foot of the jar) are trimmed, return them to a shelf to continue drying with the lid in place. Still keep paper toweling across the gallery to separate the lid and jar. Once the jar and lid are bone-dry, bisque fire them. Again, keep the lid in place. Once out of the bisque kiln, you can decorate the jar with underglazes and glazes. Before doing so, always make certain to apply wax resist. Not only should you wax the bottom of your jar, but also all areas where the lid and jar meet. Just as when you wax the bottom, wax a thin "buffer zone", this time about one-eighth of an inch wide, past the areas where the lid and jar meet on both the interior and exterior surfaces. The wax resist will help ensure that no underglaze or glaze material will weld your lid and jar together. However, underglaze and glaze can still bead up on the waxed areas. Make certain to wipe all waxed areas clean as you decorate and glaze. Tip: As you glaze, also glaze the middle interior of the lid (away from where it meets the jar). This will help avoid tension on the clay body that would occur if only one side were glazed. Once the decoration and glaze have dried, you are ready to load your glaze kiln. Fire the jar to glaze maturity.